Through March key members of the STP team will be selecting their top 5 favourite pieces of furniture from the archives. They could be old, they could be new, there is nothing borrowed, but there is something blue! It may be that they loved the design, or some technical aspect of making it. It may be the timber or the combination of materials. There will be an image plus little explanation of why they selected it. These are Mike’s. Michael Smith became part of the Simon Thomas Pirie team in 2007. 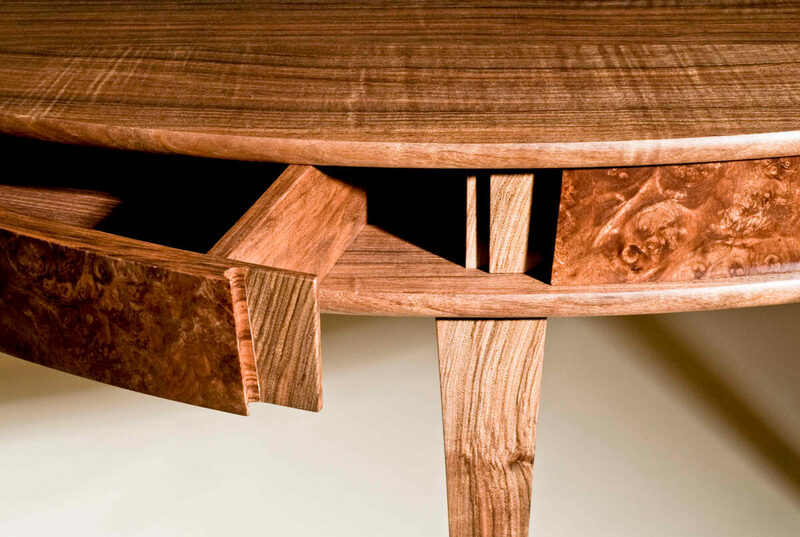 He is ‘a natural born cabinet maker’ with the skills, diligence and creative confidence of someone twice his age. Mike loves the diversity of projects and techniques that we throw at him, he’s happiest when he’s busy and challenged. He has chosen some very interesting pieces for his top five list, i’ve struggled to find images of some of them as they were not all professionally photographed. Normally a reflection of a tight deadline and when Mike is at his best! 5. 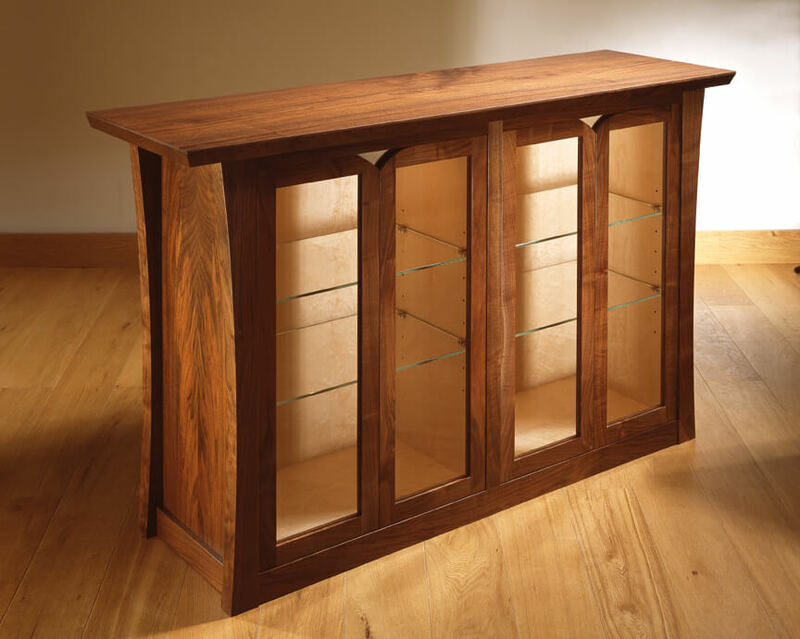 So, without further ado Mike’s no.5 choice is a speculative piece we sold quite recently – a low display cabinet in English grown black walnut. The tree came from the grounds of a stately home (now a girls school in North Dorset). It’s spectacular timber and very different from the run of the mill commercial imported US black walnut. Colour was more purple / redish and it had been an huge tree so the grain pattern was really expansive. The internal sections were lit and made from another oddity – a birds-eye sycamore, never seen it before or since. Great piece to open with. 4. 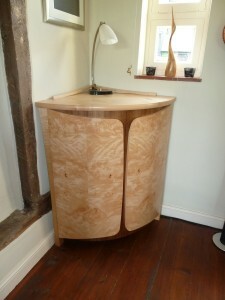 Is a very unusual corner drinks cabinet. This is one of those pieces we just didn’t have time to photograph properly before it left the workshop, so what you see are the post delivery ‘snaps’. Mike particularly enjoyed making this because there were lots of intricate elements like the 2 part laminated doors, the internal bottle racks on the back of the doors and the delicate upstand around the top. The materials are also pretty unusual, that burr sycamore on the door is rare. The detail behind is English walnut whichs adds contrast but in a subtle way. From Mike’s perspective this was close to a perfect ‘make’, and that’s what gives him a such a buzz. Just as an add on, kind of a no.4a – that’s allowed, just: This is the tray we made last month to sit on top of that cabinet. It was always intended to have the matching tray, it just took a while for it to happen. Same materials, and of course same maker. 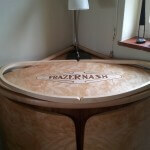 The Frazer Nash logo is because the client is a classic British car nut! 3. 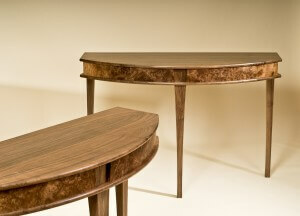 Is something really special from 2011: A pair of pivot draw console tables in English walnut. As the name suggests the drawers – 2 in each table, pivot from the outside corner, opened from the centre recessed handle. “Brilliant timber, very complicated to make, lovely engineering on the pivot and the fact there are a pair of them.” is why they make Mike’s list. There is a nice bit of engineering in those pivots by our friends at I.P. Engineering, they like their work are the unsung heros in this piece, you just can’t see how good it is. We were able to match the grain of the tops and front of these table because we had bought the this most spectacular walnut log years before. So we had a whole series of consecutive boards we could match almost perfectly. To see what else we made out of this amazing log over many years click here. These tables were high on all of our lists. 2. I was surprised by this because Mike’s never made a set of these – at 2 it’s our ‘Gazelle2’ armchairs. This is a variant of the first chair i ever designed way back in 1993 while I was at Hooke Park, originally as part of a set of 40 for the Bournemouth University Senate Room. These are rather prettier with a delicate and slightly oriental fabric on which really lifts them. It’s a lovely image as well. One in bleached sycamore, one in black walnut. From Mike’s perspective, although he’s not made any of these, he’d really like too because he loves the complicated shapes of the back. He loves chair making – there is something very pleasing about seeing stacks of chair components in the workshop. “I like ordered stacks”. There is a control freak in every furniture maker! 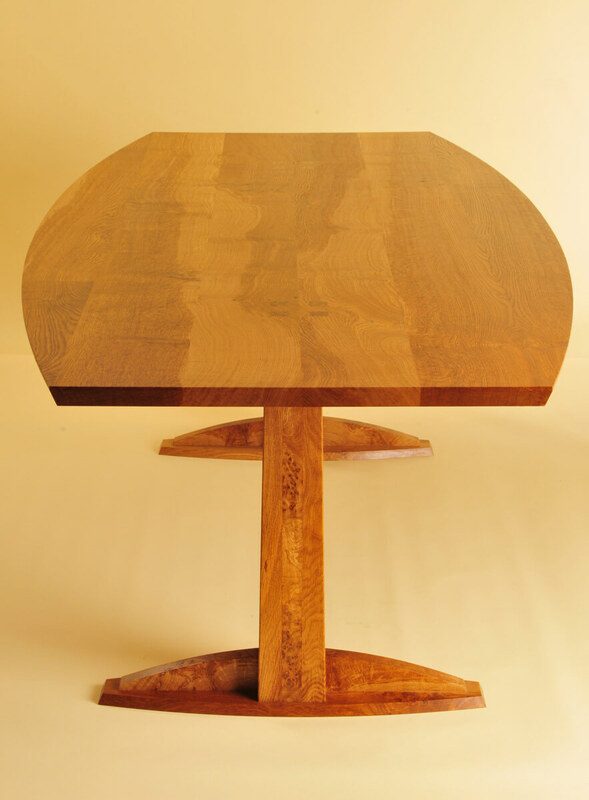 Interestingly this is a variation on the ‘Lozenge’ table that John choose as his favorite piece of all time last week – well at least the top is a similar shape. So why does he not like this. Well it’s down to the wood. It was a really big English brown oak log that we bought for another job but we felt it was just too wild for it. There was huge variety in colour and some areas of each board were verging on burr brown oak. In a way this is typical of much English timber – overflowing with character and just too much for many, particularly in a world of refined, usually veneered, and some would say bland interiors. So we had this log, we just needed to find the clients to fall in love with it. 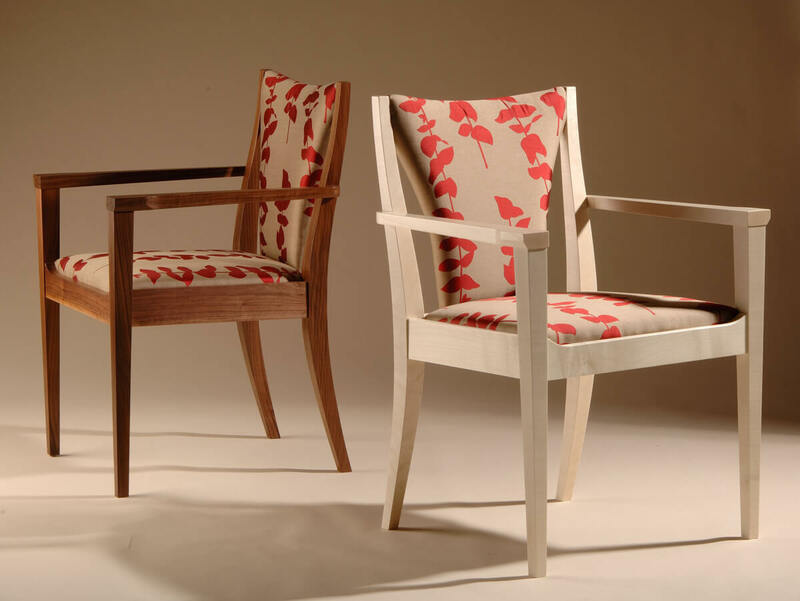 They found us during an open workshop event and commissioned a couple of ‘Oryx2’ armchairs to boot, they are the slatted version of the ‘Gazelle2’ above. So Mike loved the wood but he had a job turning it into a top that worked. We ended up with a very purposeful stripe and contrast along it length, using dark detail inlays in the light end and dark inlays in the lighter wood at the other end. The clients adore it. The underframe is different to the other Lozenge table, but still very architectural and bridge like. We used contrasting bits of the tree to good effect here too. Each pedestal support had a strip of dark burr brown oak inset. 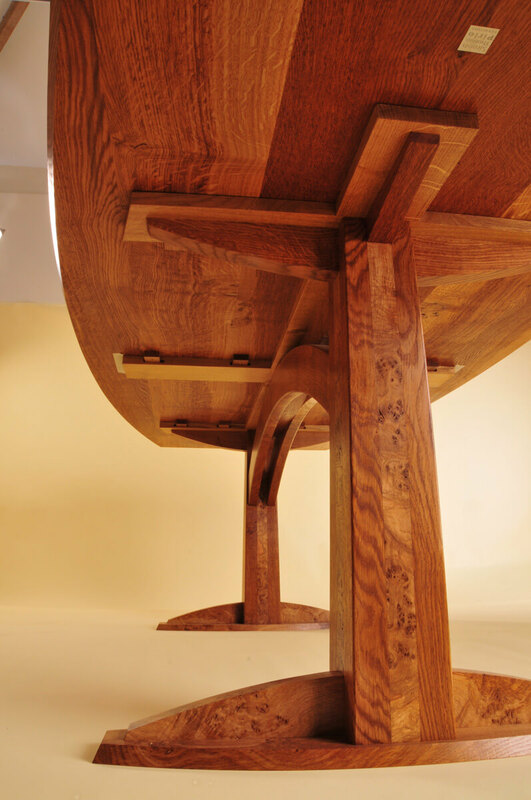 As with so many of our tables the underside is almost more exciting than the top! 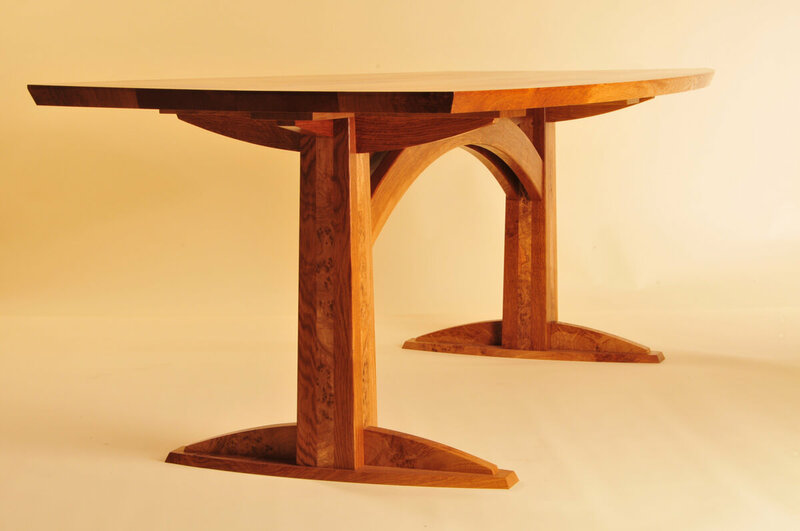 Mike and I delivered this table – one of the reasons he choose this piece is because the clients were just so blown away with it and they let him know. “It also worked in the space perfectly” he says. That space is in a lovely Victorian Rectory dining room – made for it! He loved the timber, loved the challenge of making it, loved the design and was flattered to bits with the praise from the client. Well deserved.